This flavorful, juicy Instant Pot Meatloaf is one of my family’s favorite easy instant pot dinners! The meatloaf is made with ground beef (or a combination of ground beef and ground turkey), breadcrumbs, spices, and eggs, and I usually add potatoes to the bottom of the instant pot to make mashed potatoes at the same time, for an all-in-one meal! This easy meatloaf recipe made in the Instant pot turns out just as flavorful and delicious as any other cooking method (and if you don’t have an instant pot, I’ve included alternate cooking methods). Serve meatloaf with a Classic Wedge Salad or my favorite Baked Mac and Cheese. I’m confidant your family is going to love it! My family absolutely loves meatloaf, but before the instant pot emerged I usually made mini meatloafs in a muffin tin. Now this instant pot meatloaf and mashed potatoes dinner is my go-to. One of the things I love is that you can prepare the meatloaf in advance and refrigerate it until you’re ready to cook dinner. Be sure to cover it well with plastic wrap, or store it in an air-tight container. The meatloaf sauce can also be made ahead of time and stored in the fridge until you’re ready to use it. How do you make meatloaf in the instant pot? Add all of the meatloaf ingredients to a bowl and mix everything to combine. Be careful not to over-mix the meat, which can result in a tougher loaf. Place the meat on one or two pieces of tinfoil and shape it into a round loaf that will fit inside your instant pot. Fold the sides of the tinfoil up to make a nest for the meatloaf, making sure the sides of the tinfoil are tall enough that grease wont be able to leak out. Add one cup of water to the bottom of the instant pot, followed by a wire trivet and then place the meatloaf on top. Secure the lid and close the pressure release valve. Cook on high pressure for 25 minutes. When the timer beeps allow the pressure to naturally release for 10 minutes. While the meatloaf is cooking, mix all of the sauce ingredients together in a small bowl. You may choose to warm the sauce in the microwave for serving. When the meatloaf is finished cooking, carefully pull up on the sides of the tinfoil to remove it from the pot. Spoon the sauce over the meatloaf and allow it to rest for a few minutes before cutting it into slices. Cut the potatoes into quarters and add them to the bottom of the instant pot along with water and salt. Place a wire trivet on top of the potatoes. Set the meatloaf on top of the potatoes. Cook on high pressure for 25 minutes. When the timer beeps allow the pressure to naturally release for 10 minutes. Remove the meatloaf and wire trivet. Add milk, butter, sour cream, bouillon paste and salt and pepper to the potatoes and mash them to your desired consistency. 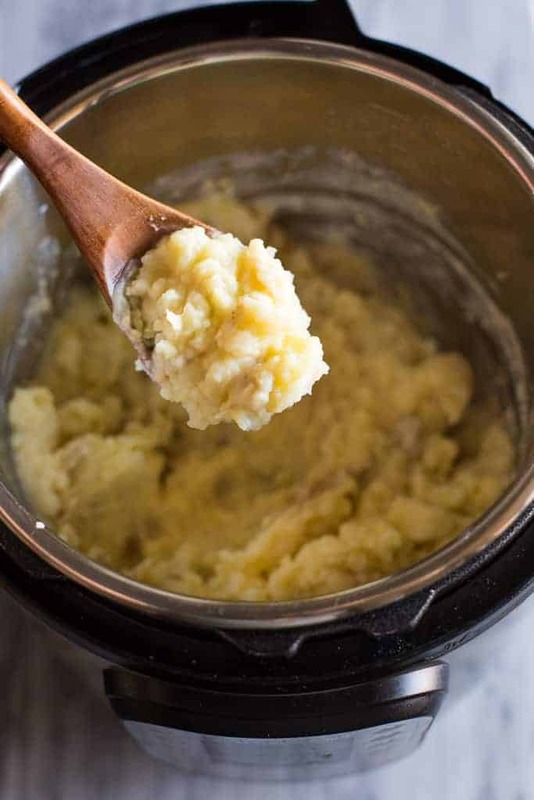 Be careful not to over-mash the potatoes because the more you mix them, the more likely they are to get gluey and starchy. Add more seasonings or milk as needed, to taste. Serve them immediately with the meatloaf. 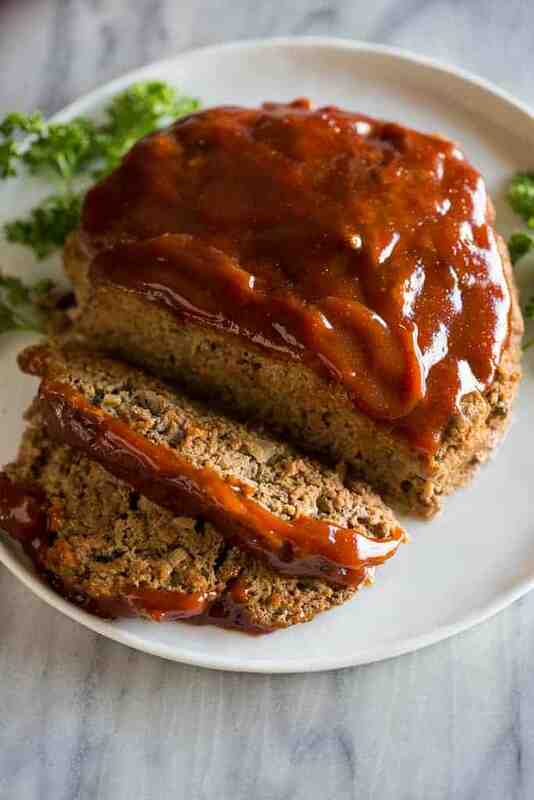 This meatloaf sauce only requires four simple ingredients: ketchup, brown sugar, dijon mustard, and nutmeg. Combine the sauce ingredients together in a bowl and stir until smooth. Meatloaf sauce can be made up to one week ahead of time, stored in the fridge. What kind of meat is best for meatloaf? You can use any type of ground meat to make meatloaf, including ground beef, ground turkey, and ground pork. High fat meat, like ground chuck, makes a more tender meatloaf. I like a blend of half ground beef and half ground turkey or pork, but you can use 100% ground beef or other ground meat if you’d like. 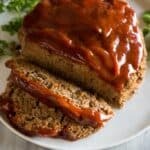 How long should I cook meatloaf in the instant pot? Cook the meatloaf on high pressure for 25 minutes and allow the pressure to naturally release for 10 minutes before opening the lid. If you want to double check the temperature, an instant read thermometer should register about 160 degrees at the center of the meatloaf. If for some reason the meatloaf has not cooked to your liking you can finish cooking it in the oven at 375 degrees. Can I make this meatloaf recipe in the oven? If you don’t have an instant pot you can easily adapt this recipe to bake the meatloaf in the oven. 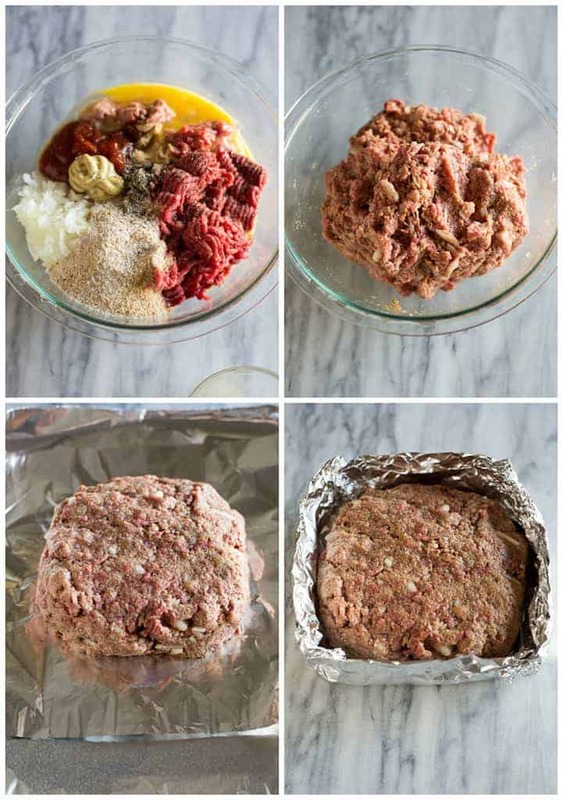 Mold the meatloaf into a 9×4 inch loaf and place it in the same tinfoil nest. Place it on a baking sheet, spread with half of the sauce and bake at 375 degrees F for about 45-50 minutes or until an instant-read thermometer reaches 160 degrees F in the center of the meatloaf. 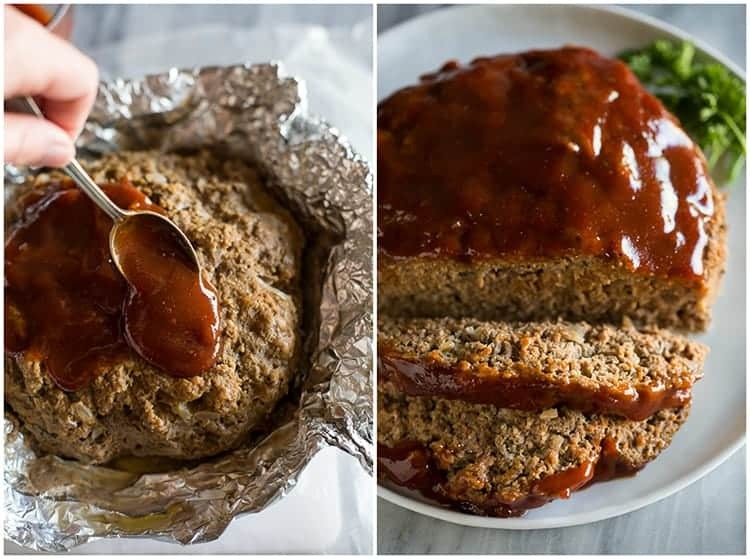 Tent the meatloaf with foil and allow it to rest for at least 10 minutes before serving. Spoon the remaining sauce on top. Can I make meatloaf in the slow cooker? Yes, you can use this same recipe to make the meatloaf in your slow cooker or crock pot. Line the bottom of your slow cooker with tinfoil and place the meatloaf on top. Add the sauce on top, reserving some of it for after it’s cooked, if you’d like. Cook on LOW for 6 hours, or HIGH for 3 hours or until an instant-read thermometer reaches 160 degrees F in the center of the meatloaf. 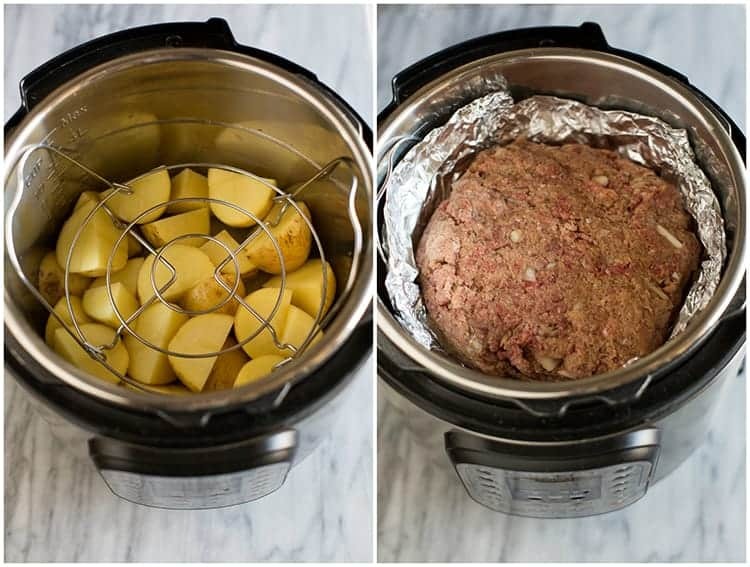 If you want to try cooking potatoes in the slow cooker at the same time as the meatloaf (I haven’t tried this myself, but think it will work), put the meatloaf in foil to separate it from the potatoes. 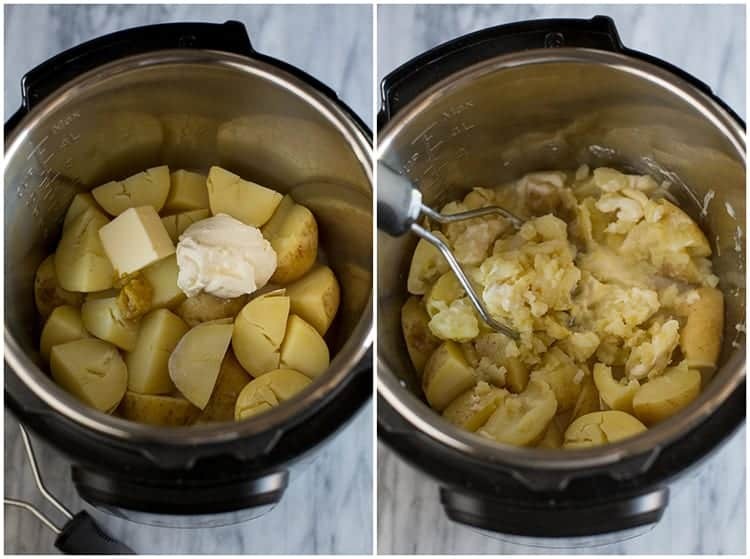 Cut the potatoes into chunks and add to the slow cooker with 1 cup of vegetable or chicken broth, and salt. Cook for 6 hours on LOW or 3 hours on HIGH. Make the mashed potatoes according to recipe. 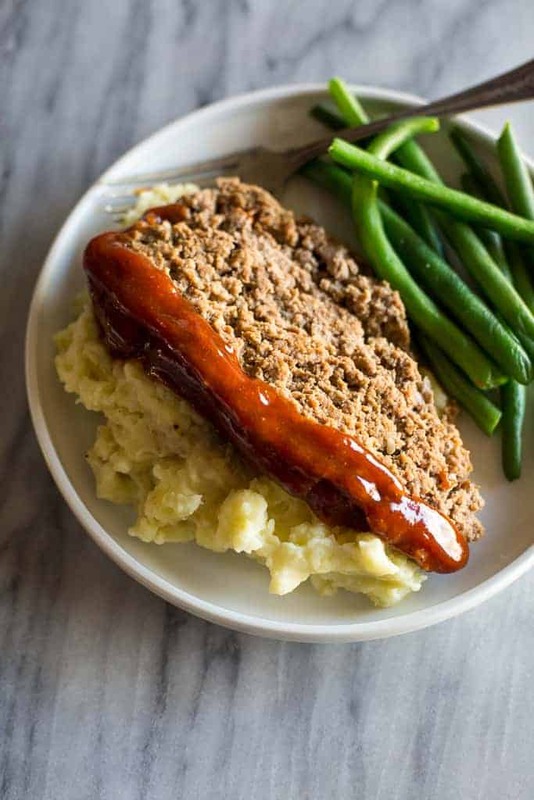 Instant Pot Meatloaf with mashed potatoes is made with a mixture of ground beef and ground turkey as well as delicious Yukon Gold potatoes. It's an easy dinner recipe that the whole family will enjoy! Add all of the meatloaf ingredients to a large bowl and gently mix everything to combine (without over-working the meat). Form the meat mixture into a round loaf that will fit into your instant pot. Add the quartered potatoes, water, and salt to the bottom of the instant pot. Lay the IP wire rack on top of the potatoes. Place the tinfoil nest with the meatloaf on top of the rack. Secure the lid on the pot and close the pressure release valve. Select manual/High pressure and cook at high pressure for 25 minutes. When the timer beeps, allow the pressure to naturally release for 10 minutes. 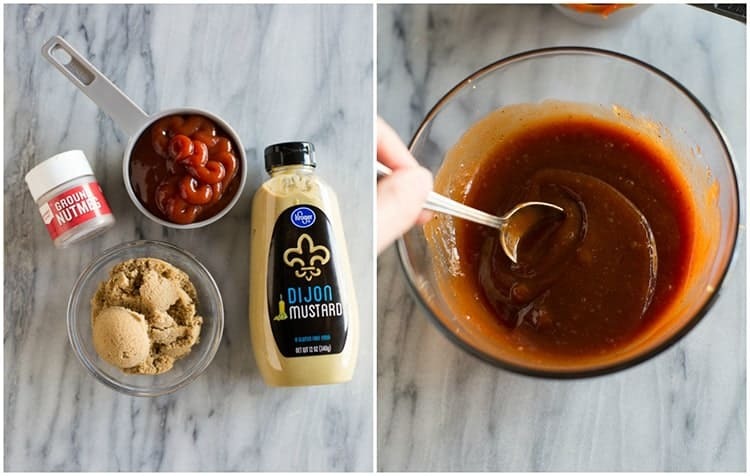 While the meatloaf cooks, make the sauce by combining all of the sauce ingredients in a bowl. Remove the IP lid, and carefully remove the meatloaf. Discard the tinfoil and dippings. Spoon the meatloaf sauce over the top and cut into slices. Add the milk, sour cream, butter, bouillon paste, and salt and pepper to the bottom of the instant pot with the mashed potatoes. Mash to combine (but don't over-mash the potatoes). Taste and adjust seasonings, as needed. You can make meatloaf one day in advance and store it the fridge (uncooked) and covered well. Place uncooked meatloaf in a loaf pan or freezer safe container and cover well. Freeze for up to 3 months. Thaw the meatloaf in the fridge overnight, and then bake as directed. I couldn’t believe how easy and yummy this was. Definitely going into my new rotation! I have made meatloaf in the Instant Pot and we love it. I didn’t think to put the potatoes in as well. I will definitely do that from now on. Thanks so much for this recipe! Question…can i use a loaf pan to make this, or is it required to use the aluminum foil “pan”? Thank you so much for this recipe! My family loved this meatloaf! They aren’t too fond of the instant pot but this was an absolute hit. I was even lazy and just used a can of tomato soup with some water mixed in with some of the drippings. Best instant pot recipe ever. I’m so glad you liked it! Thanks for coming back to comment–I hope you get to try more of my instant pot recipes soon! One of the best meat loaves I have ever made. It was tasty and just the right texture. I did not have the sage but was still good. The potatoes were good with just some butter. Will make again.